The light green is a blizzard watch. 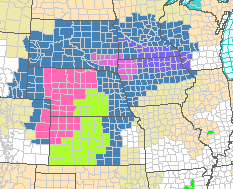 Pinkish colors are winter storm warnings. The bluish colors are winter storm watches. Compare to this morning's map below. I suspect the blizzard watch is going to have been scooted a bit east in Kansas and Nebraska. In Wichita and Omaha, try to have your travel completed by 11pm Wednesday evening. In Kansas City, by 4pm Thursday. Icing conditions may develop in northern Illinois, including Chicago, on Thursday, so more problems are likely at the Chicago airports. Iowa will also see freezing rain with potential ice storm conditions as winds increase in speed Thursday. Please take this storm seriously and plan your travel around the weather. UPDATE: 6:55pm Central. Before this storm is finished, I believe the following interstate highways will be closed at one location or another: 29, 35, 135, 70, 80, 90 and, possibly, 76. 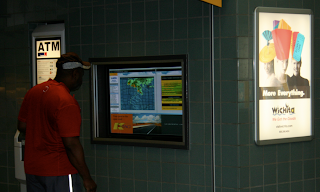 If you travel the Kansas Turnpike, you can check out the live weather displays, powered by WeatherData®, at the major rest stops.